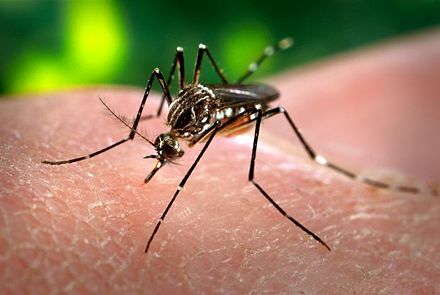 Aedes aegypti, the mosquito capable of transmitting the zika virus. Photo from Wikipedia. Brazil is facing an epidemic of a severe birth defect: microcephaly (abnormally small head size), a condition linked with important neurological impairments and developmental delays. Not all children born with an abnormally small circumference of the head suffer from these problems, but many do. The microcephaly epidemic has been linked to an infection with the zika virus, transmitted by the mosquito Aedes aegypti . The latest epidemiological bulletin of the Brazilian Ministry of Health, dated January 5, 2016, reported 3,174 suspected cases . Nearly all the cases of microcephaly were observed in the Northeast of Brazil, especially in the states of Pernambuco, Paraiba and Bahia. The Brazilian Ministry of Health declared the microcephaly outbreak a sanitary emergency, and advised women in the most affected regions to postpone pregnancies. The Health Ministry instructed hospitals with microcephaly cases to send samples of blood from newborns diagnosed with this condition, together with samples of placenta tissue (if available) and maternal blood, to a virology laboratory. There was no mention of the possibility of a prenatal diagnosis of microcephaly or of maternal and fetal infection with the zika virus – for a very clear reason. It is possible to diagnose suspected microcephaly during an ultrasound examination in the third trimester of pregnancy, although the diagnosis is more difficult in borderline cases. It is also possible to verify whether a pregnant woman who lives in an affected region and suffers from a suspicious “fever” (often accompanied by a typical rash) is infected with zika, and if that is the case, to perform amniocentesis to check if the fetus is infected too. The question, however, is to what end? Finding out that a pregnant woman is at risk of giving birth to a child with microcephaly will only increase her anguish. There is no treatment which can prevent an abnormal development of the fetal brain, and since Brazilian laws do not allow abortion for a fetal indication with the sole exception of anencephaly (the absence of a brain), she cannot elect to interrupt the pregnancy. The Brazilian government focuses its efforts to stop the microcephaly epidemic on fighting the spread of zika infections, undoubtedly an important goal, but difficult to achieve rapidly. In the meantime, Brazilian specialists such as Maria Angela Rocha, a pediatrician from Para Thomaz Gollop, a fetal medicine expert from Sao Paolo, who was interviewed by Folha de Sao Paolo, December 1st, 2015 and the virologist Pedro Vasconcelos (interviewed by O Globo, December 5th, 2015) have expressed their despair and feeling of impotence when observing the rapid progress of cases of microcephaly. As Dr. Vaconcelos put it, “We have our feet and hands tied down” . It is important to examine the accuracy of this statement, and whether physicians’ inaction is the only possible answer to the mounting numbers of children born with severe neurological impairment in Brazil. There is important historical precedent: doctors’ reaction to infection with rubella (German measles). A women infected with the rubella virus in the first trimester of pregnancy is at high risk of giving birth to a child with severe fetal malformations. The rubella virus attacks the fetal central neural system and can induce numerous fetal malformations: blindness, deafness (and not infrequently a combination of both), neurological problems and microcephaly. It is impossible to predict the extent of such malformations: some children born to infected mothers are healthy, some have sensory impairment(s) but no additional health problems, some have severe neurological and cognitive problems. Many women who contracted rubella early in pregnancy and were aware of links between this disease and a risk of fetal malformations wished to terminate the pregnancy. In the 1940s, ’50s and ’60s, abortion was criminalized in Western Europe; doctors who performed abortions risked prison and the loss of their medical licenses. In spite of these legal restrictions, numerous British and French doctors provided abortions to pregnant women infected with rubella . Not all physicians in the UK and France believed that rubella infection during the first trimester of pregnancy justified abortion. Physicians held different opinions about abortion for fetal impairment; they also had divergent evaluations of the risk of birth defects linked to rubella infection. Animated debate among physicians had limited practical consequences, however. In the 1950s and ’60s, British and French women infected with rubella early in pregnancy who were aware of the risk of fetal malformations and wanted abortions were nearly always able to find practitioners willing to brave legal interdictions, either in private practice or, in the great majority of cases, in public hospitals and clinics. In a widely debated paper on rubella and abortion published March 14, 1959 in the British Medical Journal, the pioneer of medical genetics, Julia Bell of University College, London, stated that “now the facts of the situation have accumulated so that one can state without doubt that rubella in the early weeks of pregnancy is such a menace to the normal development of the fetus that it constitutes a risk one cannot allow to be taken for the unborn child.” Abortion, Bell explained 10 years before the legalization of abortion in the UK—had become the generally recognized treatment for the risk of fetal malformation induced by infection with the rubella virus: “to such an extent has this become routine treatment that maybe we can no longer hope to get measure of the risk involved or discover what proportion of such occurrences can be expected to result in a normally developed child” . In the mid-20th century, experts who argued that women who contracted rubella early in pregnancy should be allowed to elect abortion spoke about a risk of suffering for the child and the family, not the certainty of such suffering. People with severe impairments could live happy and fulfilling lives; their families need not face distress and could find unexpected joy in raising an impaired child, especially with support from the larger society. Nevertheless, the concern that the birth of a severely impaired child may be a source of distress and difficulty for the child’s mother and other members of her family is no less valid in 2015 than it was in 1959. Only a pregnant woman, many doctors believed in the mid-20th century, could decide whether she was ready and capable of caring for a special needs child, not infrequently for life. Brazilian women today are not legally entitled to make such decisions, and in this area like many others, poor women have more circumscribed choices than affluent ones. And the number of newborns born with microcephaly is steadily increasing. Some experts fear that the epidemic of neurological impairments might be more severe than current evaluations suggest. These are based exclusively on measuring the circumference of the newborn’s cranium, but children born to infected mothers can have a normal head size and still suffer brain lesions which will induce neurological and cognitive difficulties. In another time and place, physicians who, like their Brazilian colleagues today, worked in countries that criminalized abortion, had a different attitude. In a letter to the British Medical Journal dated April 25, 1959, British obstetrician Bevis Brock of St. Bartholomew’s Hospital, London explained there is a widespread agreement that “when a pregnant mother, having had rubella, is aware of the risks and is prepared to face them, then no one would try to persuade her to accept termination. But if she feels unable to face the appalling anxiety of a pregnancy overshadowed by fear of a blind or deaf child, then it requires strong convictions to refuse this request” . One must wonder whether Brazilian doctors’ unwillingness to consider interventions beyond the strict limits of the law reflects such strong convictions, or is influenced also by the fact that the majority of women at high risk of giving birth to children with microcephaly live in poor, often neglected areas. On the attitude of UK doctors see, Peter Coventry, The Dynamics of Medical Genetics: The Development and Articulation of Clinical and Technical Services Under the NHS, Especially at Manchester c. 1945-1979, unpublished PhD thesis, Manchester University, 2000, chapter 7, and on one of the French doctors, Isabelle Ville and Lynda Lotte, ‘Évolution des politiques publiques : handicap, périnatalité, avortement’ , in Final Report of the ANR project-09-SSOC-026 ‘Les enjeux du diagnostic prénatal dans la prévention des handicaps : l’usage des techniques entre progrès scientifiques et action publique ‘, Paris, 2013. Julia Bell, ‘On rubella in pregnancy’, British Medical Journal, 1959, 1: 686-688, quotation p. 686. Julia Bell was of the pioneers of human genetics in the UK. Among others, she collaborated with J.B.S. Haldane on linkage studies in the 1930s, and, in 1943 was co-discoverer, with J. Martin, of the fragile X syndrome. Bevis Brock, ‘Rubella in pregnancy’, British Medical Journal, 1959, i: 1117. Ilana Löwy is a senior researcher at INSERM (Institut National de la Santé et de la Recherche Scientifique), CERMES 3, Paris. Trained as a biologist with a PhD in immunology, she then retrained as a historian of science and medicine. Her main research interests are relationships between laboratory sciences, clinical medicine and public health. She is interested in the history of bacteriology, immunology, tropical medicine, and oncology and in intersection between gender studies and biomedicine. She is currently studying the history of birth defects and prenatal diagnosis in a comparative perspective. Her recent books are: Preventive Strikes: Women, Precancer and Prophylactic Surgery, Johns Hopkins University Press, 2009; A Woman’s Disease: A History of Cervical Cancer, Oxford University Press, 2011. This entry was posted in Online/Exclusives and tagged Brazil, epidemics, health, zika. Abortion is truly the elephant in the room with zika. Great piece with important historical perspective. How incredibly sad that the babies are mentioned throughout the article as if they are mere objects or property of the women. We are not concerned for the child , we only care about the women and the “appalling anxiety ” she faces from having a deaf or blind child , as referenced at the end of the article . It’s as if the woman’s ability or desire to care for the child directly determines if the child is a person or disposable object .Microcephaly IS scary. It is true that the challenges one faces when birthing children with disabilities are major . But the underlying assumption in this article is that a Human person that is smaller and still in the womb (as has every other human that preceded it been) does not have intrinsic value . This smaller, younger Human, this child , this baby , only has rights if the mother says so or feels she can handle what birthing the human entails . I used to STRONGLY share the sentiments expressed in this article but I no longer believe that we as women have the right to determine the extent of human rights that the human child in our womb has . No slave master had that right over his “human property” and no woman has that right over the baby in her womb . We need to address this very difficult issue, as we do with others : With love , compassion , resources and legitimate options for ALL of the humans involved . A person’s value is not reduced by them being black , poor, blind , autistic etc. We can’t dispose of Human beings like this ! We don’t tackle poverty or HIV or Ebola by agreeing to gather and kill members in society who we deem to be at the bottom. We don’t gather the disabled , old, orphaned and kill them in order to address very really economic and social challenges!! I completely see why one would consider abortion a great option to avoid complications but this view stems from failing to see the humanity of all people. The babies are not human . They are obstacles . They are tissue . They are mere potential humans on the so called gradual spectrum of life . But we can word it however we want ..they are human and Alive and deserve as much love and care as the mother , whom we certainly do and should love and care . Women’s rights don’t have to be built on the destruction of the child . “I’m from Brazil and I know some people in the medical community. And what they are really pointing out as the main suspected reason for the increase of cases of Microcephaly in the country was a new batch of a tetanus vaccine. This vaccine was given to the pregnant women in Brazil and most of those vaccines were distributed to Pernambuco the state with more cases. When the Microcephaly cases started, the lab responsible for the production of this vaccine removed all the vaccines from the market. And the government apparently is covering up by pointing the Zika virus as probable cause. [Brazil] will recommend Tdap in the routine immunization programme for pregnant women from 2014 onward.4 . The report specified the Tdap produced by GlaxoSmithKline (GSK) of the United Kingdom as the one to be used. GSK has a technology transfer agreement with Brazil’s Butantan Institute for the production of the Tdap vaccine5 in Brazil. 1 Centro de Vigilância Epidemiológica “Prof. Alexandre Vranjac” (CVE). INFORME TÉCNICO–VACINA DIFTERIA, TÉTANO E COQUELUCHE (dTpa). cve.saude.sp.gov.br October 2014. 2 Guimarães LM, Neves da Costa Carneiro EL, Carvalho-Costa FA. Increasing incidence of pertussis in Brazil: a retrospective study using surveillance data. BMC Infect Dis2015; 15: 442. 3 Palazzi Sáfadi MA. Pertussis in young infants: a severe vaccine-preventable disease. Autops Case Rep April-June 2015; 5(2): 1-4. 4 World Health Organization (WHO). WHO SAGE pertussis working group: Background paper, SAGE April 2014. WHO.int April 2014. 5 Instituto Butantan. vaccines. Butantan.gov.br. 6 de Carvalho AP, Pereira EMC. Acellular pertussis vaccines for adolescents. J PediatrJuly 2000; 82(3). 9 Bevins V. Brazil’s historically poor northeast finally gets its boom. Los Angeles Times May 24, 2012. 10 Sells H. Brazil’s Northeast Emerging as Economic Powerhouse. CBN News July 23, 2012.